Last week (June 2nd to 9th) I, Nadia Manning-Thomas, Project Leader of the Knowledge Sharing in Research project made a visit to the ICARDA KSinR Pilot Project in Syria. As you may have seen from previous blog posts, the ICARDA Pilot Project recently held their International Farmers’ Conference. As part of the Monitoring and Evaluation activities of the KSinR Project, I am visiting most of the Pilot Projects to do some M&E with them up the this point, hold discussions with them about future activities and direction, take part and make observations of activities, and do some interviews with the project team, other scientists, stakeholders and beneficiaries-all where possible. The fieldwork was undertaken in two villages: Souran and Sweida. I talked with some other scientists at ICARDA about their perception of the Farmers’ Conference as well. Finally I also discussed with personell involved in information management and communication about ways to disseminate and share knowledge and results from the Farmers’ Conference, additional Pilot Project activities, and the overall Knowledge Sharing in Research project. Results from some of these discussions will be posted soon. The IRRI Knowledge Sharing in Research Pilot project held a workshop entitled “Workshop for Enhancing Knowledge Sharing in the Northern Uplands of Laos through the Laos Rice Knowledge Bank (RKB)”. The workshop was held on 12th February 2008 at the IRRI office in Luang Prabang. Eleven Lao professionals from various agricultural research and extension centers and departments, Universities and Colleges attended the workshop. Dr. Noel Magor, Head of Training Center at IRRI and Dr. Benjamin Samson, Agronomist and Leader of the KSinR Pilot Project led the workshop. Sharing of knowledge between researchers and extension workers was recognized as a win-win proposition for both parties. -are there extension materials based on this available? -is this available to extension workers? to farmers? to Universities? -is this recommended to be part of the Laos Rice Knowledge Bank? A final exercise involved the tracing of possible pathways that technology may be disseminated from the Laos Rice Knowledge Bank, as a source of extension materials. After a successful workshop, the next steps identified were for the development of fact sheets based on the technologies identified to be included in the RKB and training of personnel to use the RKB. An interesting discussion is growing on the ICARDA-organised Farmers’ Conference. The previous post (by Nadia Manning entitled “Farmers’ Conference on Participatory breeding”) giving an overview of what happened at the innovative event has begun to receive some attention. Alessandra Galie, ICARDA, who worked on the organising team has posted a few comments giving further insight into the conference from the perspective of both the organisers as well as some participants. ” Stories were a useful format to share information. They are easy to understand, they include issues of interest to farmers about agriculture and they can increase the skills of those who work in collaboration with farmers”. Comments by Egyptian participants on the last day of the conference. Comments to the post can be found by scrolling down from the original post. Keep checking that space and join in! We would love to hear what others have to say. Some 53 farmers from six countries exchanged experiences and knowledge through story telling during the Farmers’ Conference held at ICARDA Headquarters in Aleppo, 4-8 May. The conference was supported by the Knowledge Sharing Project of ICT-KM. 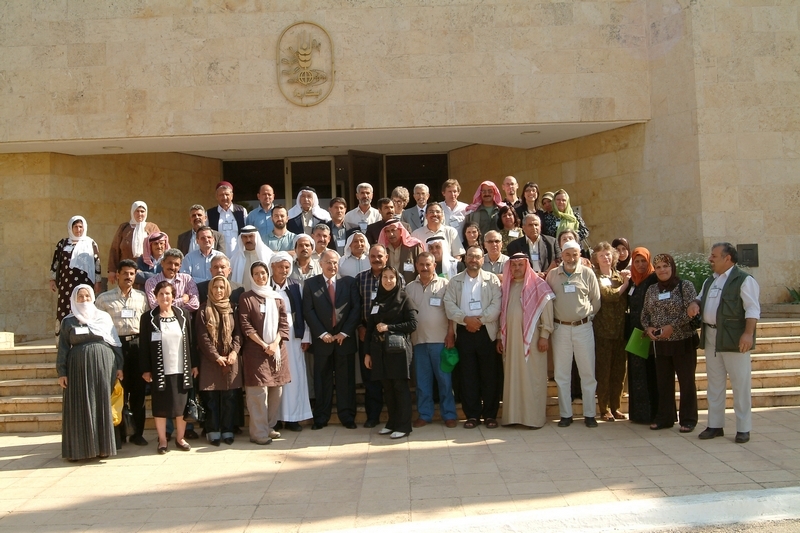 Farmers from Syria, Algeria, Iran, Jordan, Egypt and Eritrea attended the first Farmer’s Conference organized by the Barley Research Program of the BIGM. At the inaugural ceremony of the conference, Dr Salvatore Ceccarelli, a Consultant with the Barley Research Program, welcomed the participants. He said that the Farmer’s Conference, the first of its kind to be organized, has been organized as a joint activity among different partners. The objective of the conference is to bring farmers from different countries together to share their experiences and learn from each other. It is also an opportunity for the farmers to visit a research center like ICARDA, he said. Dr Kamel Shideed, Director SEPR, welcomed the participants on behalf of the Director General. He described the conference as a great opportunity for the farmers as well as the researchers. The conference will help farmers and scientists exchange knowledge and experiences. Apart from these benefits, this meeting will expand regional integration and he hoped that the bilateral interaction will continue beyond the conference. Ms Mariam Rahmanian from CENESTA, a non governmental organization based in Iran, said that it is a ground breaking conference. “The conference establishes that ICARDA takes farmers seriously and gives them importance in its research activities. Some of the farmers would not have seen a research center and the conference gives them an opportunity to visit an international center and interact with scientists,” she said. Dr Adnan Al Yassin, Director of the Dry Land Research Program of National Centre for Agricultural Research and Extension (NCARE), Jordan thanked ICARDA for organizing the conference. He said that Jordanian farmers involved in the participatory plant breeding program and attending the conference would benefit from sharing their experiences with farmers from other countries in the dry areas. Dr Mahmoud Solh, Director General, met the participants during one of the sessions and heard their experiences about participatory plant breeding. During the next four days the participants visited ICARDA facilities and farmer’s field in Souran, about 100 km South of ICARDA where they interacted with local farmers. Each day the farmers had sessions devoted to story telling, which gave them an opportunity to narrate their own experiences and learn from other farmers. Dr Stefania Grando, Principal Barley Breeder, said the conference achieved its objectives of collecting and consolidating farmers’ knowledge, which will help scientists in better targeting their research to address farmers’ needs. Also, the conference was successful in establishing linkages between national level networks of barley farmers in these six countries. The participatory barley breeding program was first implemented in Syria in 1997 and the model and concepts were gradually applied in other countries. One of the primary Knowledge Generation activities of the Knowledge Sharing in Research Project is through six (6) Pilot projects that were selected and given grants to try out/ integrate/ use/ test knowledge sharing approaches within their research projects or initiatives. * Application of KS tools to impact monitoring and project M&E to a community-based fish culture project in Vietnam. The aim is to capture important knowledge, experiences and lessons of the Pilot Projects with a view to contributing to increased understanding of the application and integration of KS concepts and approaches into research projects and activities.